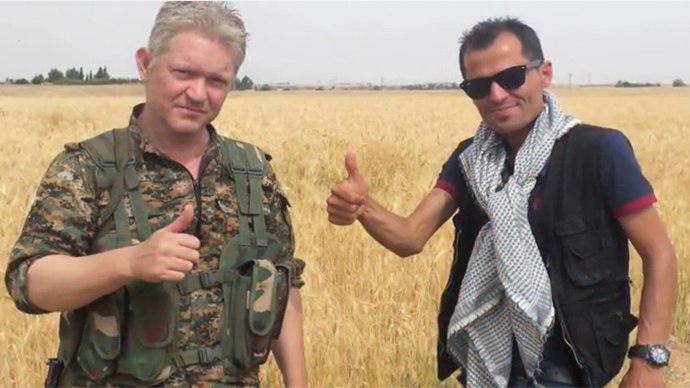 A British actor known for small Hollywood roles, including one he played alongside Johnny Depp, quit his career to join the Kurdish forces fighting against Islamic State (IS, also known as ISIS/ISIL) in Syria. Manchester-born Michael Enright was seen in a video made by the Kurdish People’s Protection Units (YPG), The Guardian reports. The video was posted on Facebook and shows Enright firing a weapon with other fighters while sitting in a trench. Calling IS “dangerous to every human being alive,” Enright asks viewers for more weapons and medical aid for the Kurdish forces. Enright is most famous for his role as the deckhand in Pirates of the Caribbean: Dead Man’s Chest. But it was the video released in February, showing a Jordanian pilot being burned alive, that was the “straw that broke the camel’s back” and pushed the actor to volunteer. The actor said he is not scared to die in the process. “I didn’t come here to run, I came here to fight. If I die, I die…I wrote to all my friends and family because I might not see them again,” he said. An increasing number of foreigners have been volunteering to help local forces fight Islamic State. In two of the most recent cases, a group of US volunteers travelled to the Philippine at the end of last month on a contract to fight groups allied with the Islamic State and half a dozen Canadian veterans joined Kurdish forces back in November to help fight against the terrorist group. The Kurdish resistance is seen as playing an important role in the fight against IS. The Kurds have managed to advance in several towns in north-eastern Syria, which were previously occupied by the terrorist group.